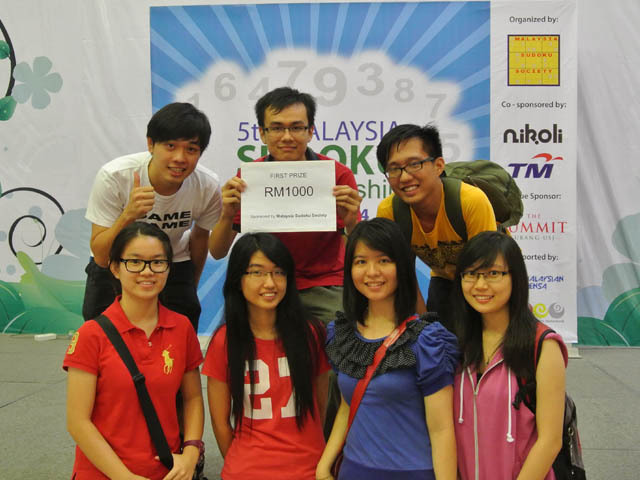 Three UTAR students from the Faculty of Accountancy and Management (FAM), and Lee Kong Chian Faculty of Engineering and Science (LKC FES) won cash prizes in the 5th Malaysia Sudoku Championship which was organised by the Malaysia Sudoku Society. The event was held at The Summit, Subang Jaya on 16 November 2014. Soon Yan Wen, a year one semester two Bachelor of Accounting student from FAM won the First Prize in the 1SUDOKU Category and brought home a cash prize of RM1,000. Meanwhile, two LKC FES students; Wong Khai Meng, a year one Software Engineering student and Tan Yong Chin, a year three Actuarial Science student, won the First and Third Prize in the SLITHERLINK Category, and Open Category 2 respectively. The cash reward for the First prize was RM1,000 and RM400 for the Third. “Playing Sudoku is my hobby. I was quite confident in winning in my category as I have taken an interest in Sudoku since my first exposure to it during my secondary school days. I am saving up the cash prize for the future,” said Wong. Supported by the Malaysian Mental Literacy Movement and Malaysian Mensa Society, this year’s championship is the 5th consecutive year that the Malaysia Sudoku Championship is being held. There were six categories and it was opened to all Malaysian citizens. The event was co-sponsored by Telekom Malaysia Berhad, and Japanese puzzle publisher Nikoli Co. The Summit Shopping Mall sponsored the venue.